Aquarium lock screen with effects generated in the Open Gl. Aquarium lock screen is a fun and free application for entertainment purposes. You can use the application to lock your phone screen. Aquarium lock screen is very easy to use. You can choose from a zip lock or PIN. Inside of the application you will find beautiful backgrounds of the underwater world. Set a PIN containing a maximum of four numbers in the settings section of the application. To unlock your phone, enter the PIN. All you have to: drag the slider down and the phone screen is unlocked. – 11 beautiful backgrounds of the underwater world to choose from. – 3D marine animals – octopus, sea horse, sea turtle and jellyfish. You can set only those elements that you like. You can change size, speed and amount of the additional elements. The final look of lock screen depends entirely on you. Aquarium lock screen is fully interactive, all objects react to your touch. In case of any problems with the effect of Aquarium, lock screen, instead of giving us the negative opinion, please send us an e-mail and review briefly the problem. 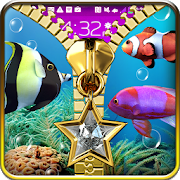 It will help us to solve it in the next updates of lock screen application with aquarium. Aquarium lock screen is free but contains ads inside application. Revenue from advertising will help us to create new attractive wallpapers and applications. All permissions are required only for advertising and are supported by trusted vendors.